Tomato and egg fried rice is very simple. There are two versions, one with tomato ketchup and this recipe is just with fresh tomato. 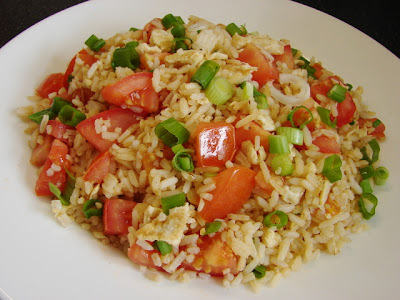 Tomato is best using red but very firm tomato, soft tomato gives a mushy and unappealing fried rice. I always use on-the-vine tomatoes more meaty, colourful and flavourful. Ensure the rice is quite dry. Soft mushy rice or wet rice never made good fried rice. Loosen the rice before cooking. Keep the heat as high as possible to avoid rice sticking or rice stewing with the tomato. Heat wok with an even layer of oil till smoking (but not smelling burning) will ensure non stick wok fried rice. Heat some oil and swirl around the wok or pan. Wait till smoking, pour the egg spread it out thin, wait for few seconds till set and lightly brown on the bottom then keep stirring to break up the egg. Fry egg till surface is a bit brown, this gives lots of flavour. Remove. Add a bit more oil and garlic. Stir till fragrant. Add rice stir till heated through. Add dash of light soy and pinch of ground pepper. Stir in scrambled egg and tomato pieces. Stir for a short while till heated through. Simple and delicious. I'd be interested to see the tomato and egg jaozi dumplings; I've not come across them before.